Discover the sacrifice, bravery and mateship of the Queensland soldier and his horse at Cobb+Co Museum. Through photographs, diaries and original objects, Horse in War tells the stories of some of the thousands of skilled horsemen from rural Queensland and across Australia who joined the war efforts. One such story is that of Esmond Lecchi, who served throughout the big Light Horse offences of 1917-1918, and was also a keen photographer. During his time in Palestine, Syria, Jordan and Egypt, Esmond photographed the day-to-day events of life with the Light Horse, providing a rare insight into life on the ground for the young Australian soldiers and the bond between soldier and horse. The centrepiece of the exhibition is an original and very rare Army General Service (GS) Wagon. Thousands of GS Wagons were used in the First World War, but now only a handful remain. The unrestored 1916 GS Wagon (Mark X) in the Horse in War exhibition has been sensitively preserved by Cobb+Co Museum staff and volunteers from SoldierOn. Watch a video on the GS Wagon preservation project. 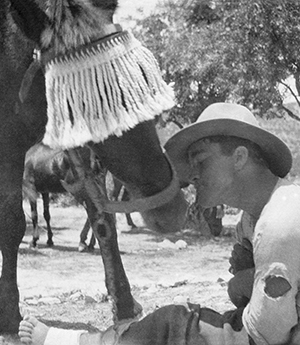 Warfare may never again rely on the trust, sacrifice and mateship of the bushman and his horse. Horse in War is a fascinating insight into this significant time in our nation’s history. Horse in War is on display at Cobb+Co Museum from 18 March until 6 December 2015, 10am-4pm daily (except Good Friday and Anzac Day).